I don't have much to blog about Yangon because I was there for a mere 3 days for work. Our partner in Yangon is a Muslim and respectfully, we had to had to scout for halal food. It wasn't hard for us since our partner is a local Muslim. We trusted him for his taste and at the same time we were adventurous, so we're up for anything. The first place we had was at Golden Inya Restaurant, which located at the Myanmar Rowing & Canoeing Federation Compound. We sat near the lake during dusk, the view was spectacular. According to the locals, this place is well-known for events and gathering, so it is "the" place to go for special events. The food was good. It's more of a banquet style where you order the dishes to share. We had a feast! And all the dishes were really good. Half of what we ordered. The roasted smoked duck and salad prawn are my favourites. This is supposedly a Burmese hot soup, but it tasted just like tom yum but a little bit more mellow. The recipe was shared by the Thai long time ago. In terms of ingredients and the way of cooking, they are pretty much similar. It's amazing how geography affects the cooking and taste of the locals. I could eat this fish alone. It has all the tastes in one dish - sweet, sour, spicy and it's an explosion in every bite. They served the fish last after I've finished all my rice and we almost forgotten that we've ordered it. I couldn't resist not eating it. We finished the fish down to the bone although we were so full. This restaurant is totally hidden from the tourist spots. It's tuck within a housing area and located on the top floor of a run-down flat. The surrounding kind of reminded me of those gangsters Hollywood movie where they hide in a refuge. I can't take a good photo of the restaurant because the place is so small. The family restaurant serves Southern Indian food, cooked by the owner himself. Currently, the restaurant is run by the owner's son, which is a second generation migrant of Indian to Yangon. We had the traditional banana leaf rice. The set comes with an option of chicken or mutton curry. The portion is pretty small. The serve Russum with the meal too! (A traditional Indian spiced herbal soup). It's totally worth a visit. But during peak hour, the service was quite bad. Do ask for an English menu. This restaurant belongs to the chain of M+ restaurants which is under the same umbrella as the first restaurant we mentioned earlier - Golden Inya Restaurant. They are halal-certified restaurants so you can eat in a peace of mind if you're looking for one. The menu is pretty much the same as #1, but there are also options for barbecue or hotpot. We didn't go for the barbecue and hotpot but settled for another banquet-style dinner. Overall, the food was good and the service was extremely friendly. They had a waiter standby for us the entire time. 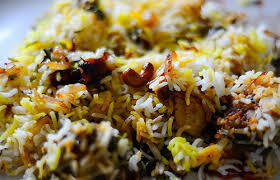 One of the places that worth going back for over and over again is the Nilar Briyani. There is nothing fancy about the restaurant, it looks just like your regular mamak stall. But the crowd is way more pack especially during lunch and dinner time. The rice is bursting of flavour with authetic herbs. You can even eat it on its own. Of course, a briyani rice is not complete without a curry dish. You can opt for beef, mutton or chicken curry. The meat is cooked in high temperature in long hours, so the result is a tender meat and flavourful curry. I don't really spend much time exploring Yangon as much as I want to. The city has a lot to offer although it is still known as a third world country. I wished I was given more opportunity to go out and explore. In terms of its gastronomy, you really can't get bored of the variety foods around the city. There are so many to choose from in terms of price, taste, different level of restaurant, etc. 'Till the next trip.